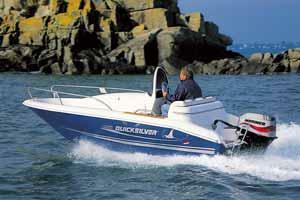 Boat Description The 425 Commander is ideal for up to 4 people and perfect for water sports or family fun. There is more storage than you would expect, a sun pad is standard equipment and the raised bow rails ensure a safer grip when anchoring the boat and give more assurance when small children are onboard. As with the 500 Commander, navigation lights are recessed into the deck.